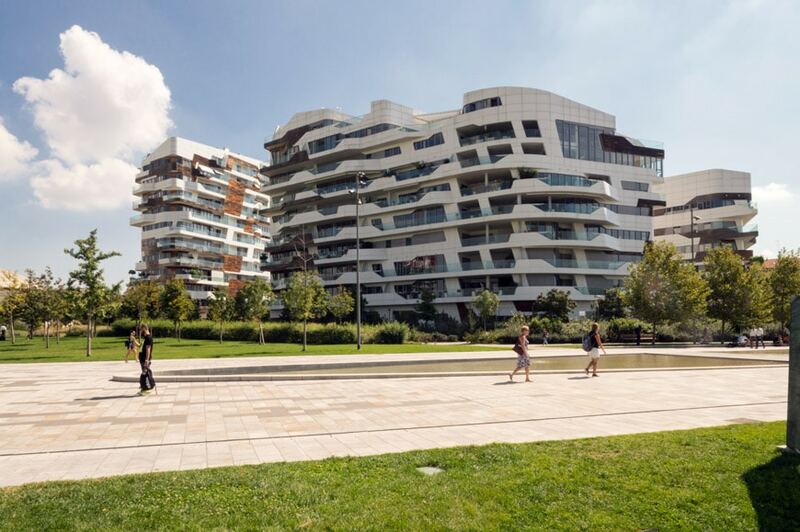 CityLife is a large (and controversial) urban redevelopment project in the grounds of the former Trade Fair of Milan, whose new buildings were designed by three of the world’s most recognized architects: Daniel Libeskind, Arata Isozaki, and Zaha Hadid. 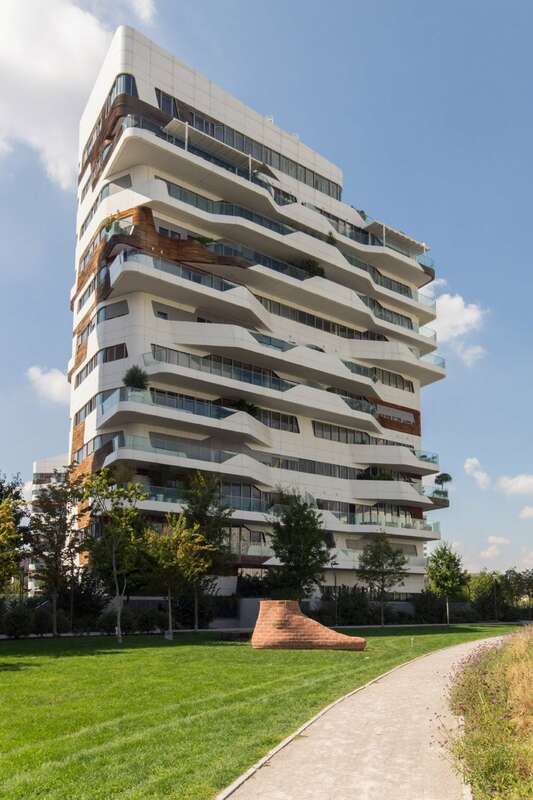 In this article, I’ll focus on the buildings by Zaha Hadid Architects, which include a residential complex and a 44-story office tower, commonly dubbed as Lo Storto (The Twisted One). 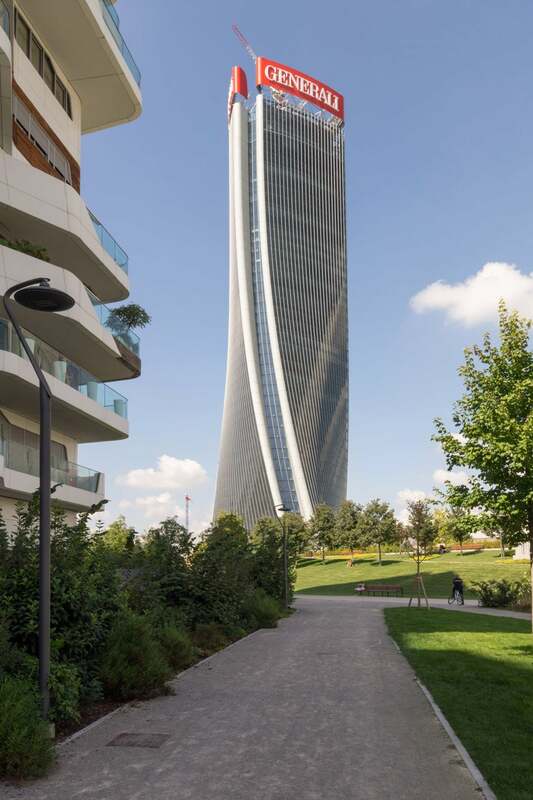 In general, the buildings designed by Zaha Hadid in Milan show all the architectural elements, someone could say all the clichés, which make the design of the Iraqi-British architect died in 2016 so recognizable; from the fluid and “aerodynamic” forms of the residences, to the twisted shape of the tower, which makes it looks like built of some sort of elastic material. 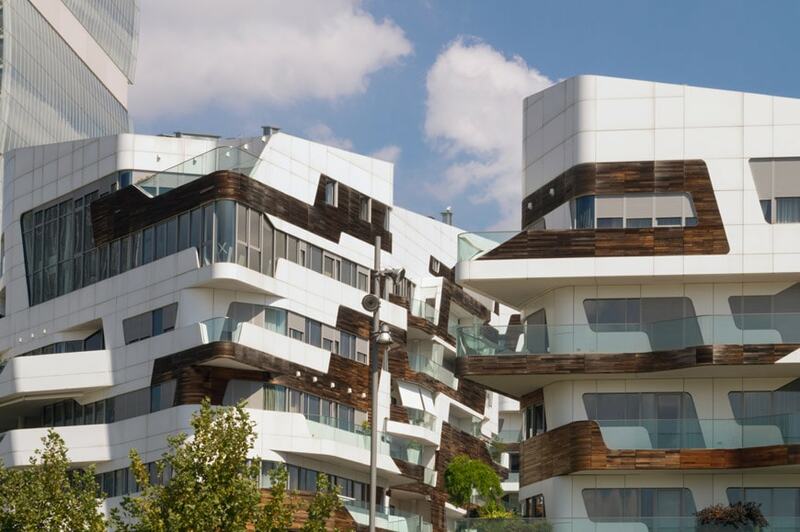 Whether you like it or not, all this is eminently “zahahadidian”; maybe it’s not her best architecture, yet those buildings indubitably bear Hadid’s stylistic and conceptual hallmark. The construction of the Generali Tower, so-called because it houses the headquarters of the insurance company Generali since 2018, was completed in 2017. 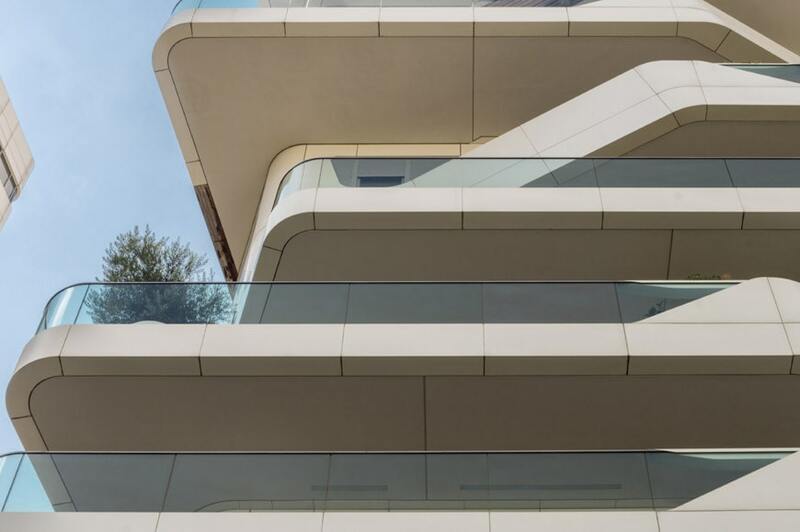 The tower is a 170-meter / 559-foot-high skyscraper built above a retail center, the Podium, designed by Zaha Hadid as well. 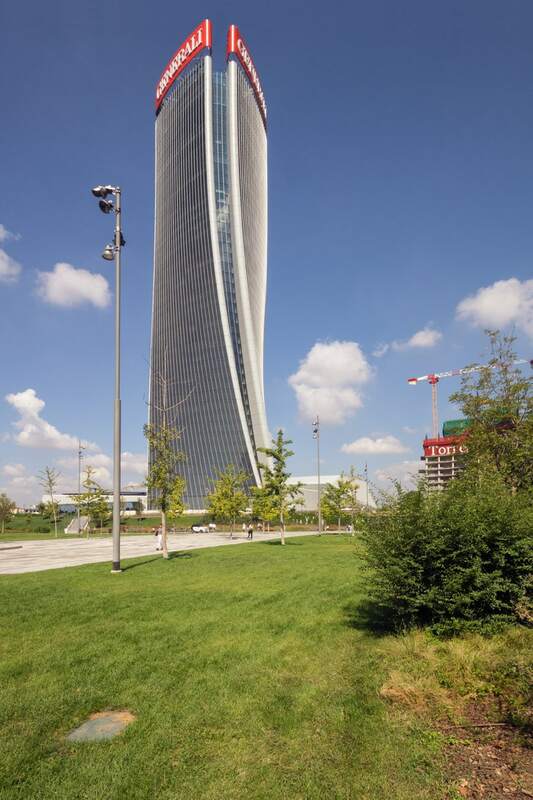 On a portion of its 150,000-square-meter gross floor area, the reinforced-concrete-and-glass tower accommodates over 2,000 employees of Generali. Looking at it from a close distance, this high-rise building caused me mixed feelings. 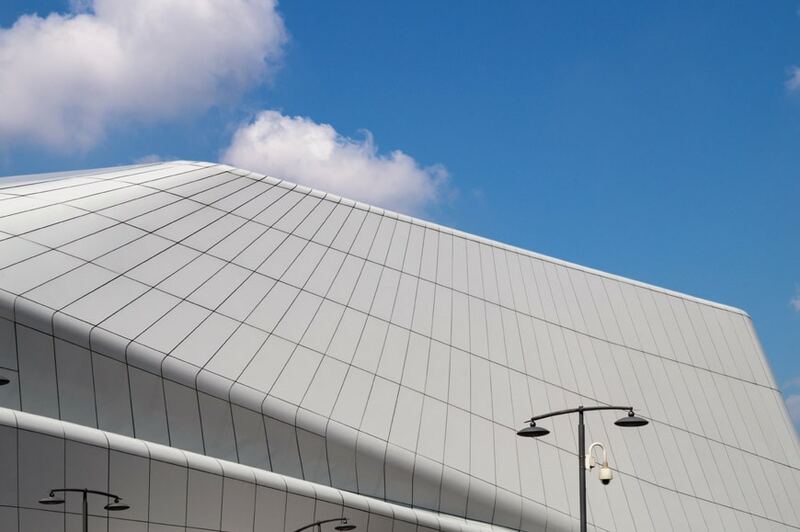 On the one hand, its twisted shape makes it a fluid-looking building, whose dynamicity is further enhanced by the large aluminum-clad ribs which visually split the tower into two halves. 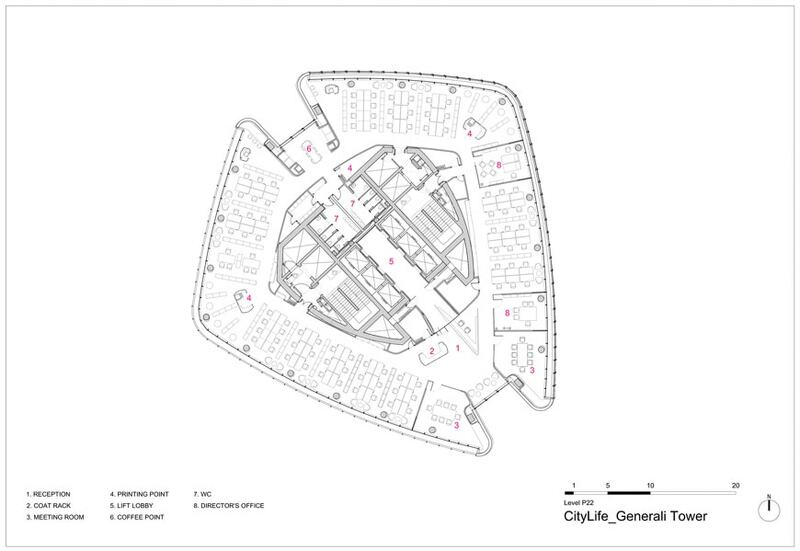 The trapezoid floor plans of the building progressively rotate of about 30 degrees from bottom to top. 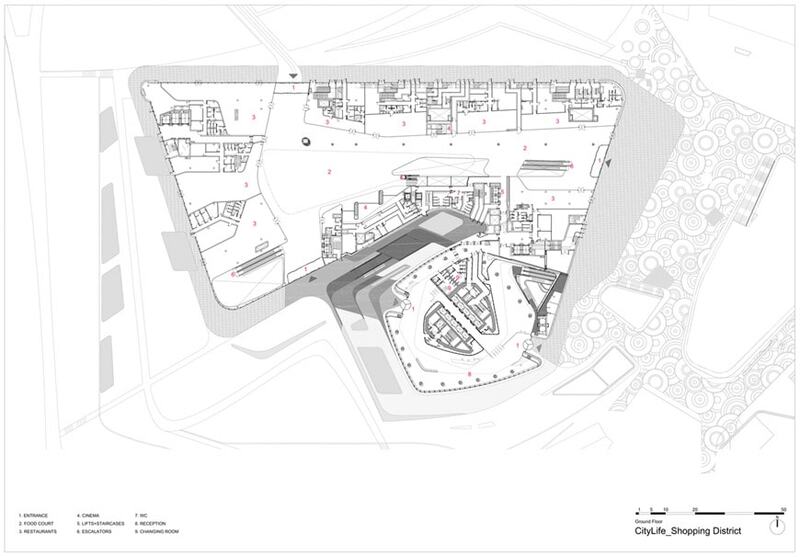 Such rotation involves only the outer part of the tower, while the building’s stiffening core – which contains the technical spaces, bathrooms, two staircases, and ten elevators – is perfectly straight, bottom to top. 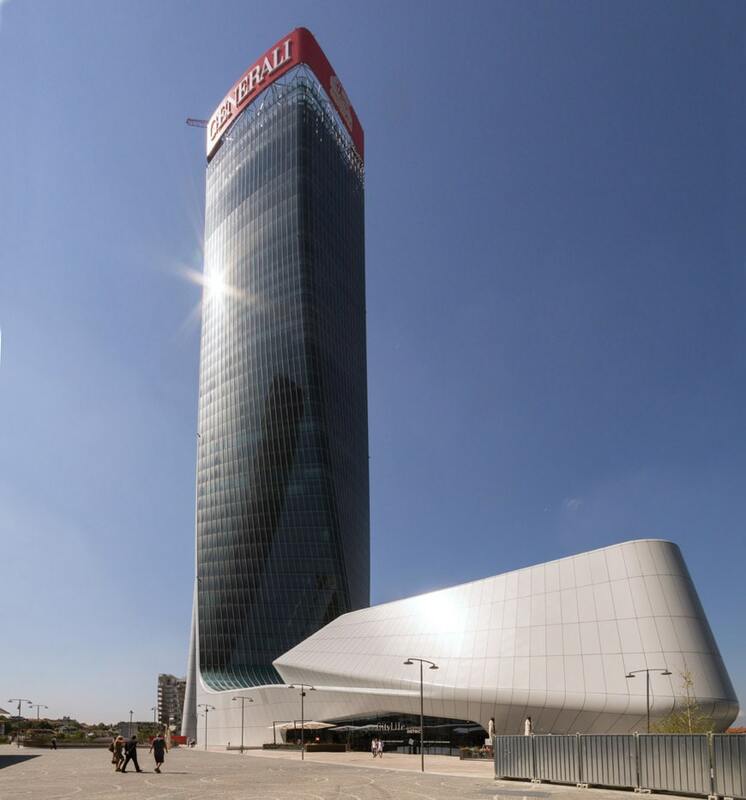 On the other hand, compared to its geometric form, the Generali Tower’s glass envelope is quite dull, dark and leaden even in a Summer sunny day, and very different from that depicted in the original renderings which show more “ethereal”, silvery facades. 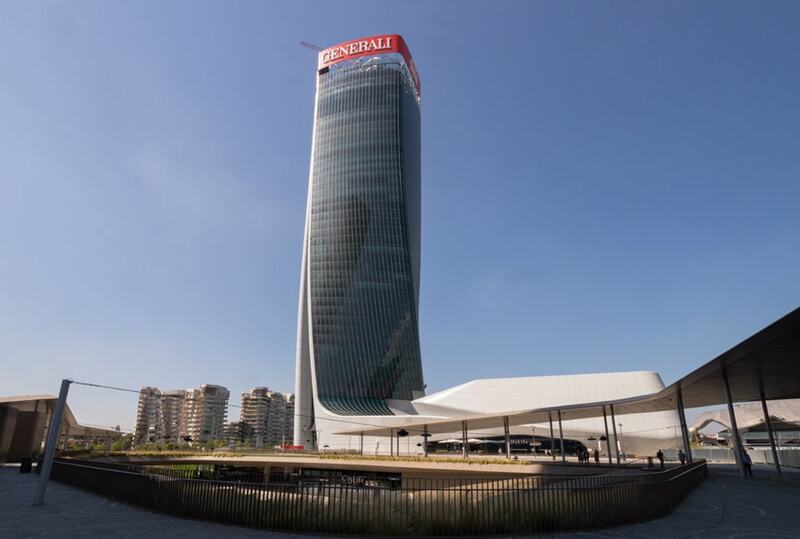 Furthermore, the gigantic red-colored Generali logo, installed on top of the tower in 2018, fatally flaws the graceful slenderness and dynamic lightness of the Building envisaged by Zaha Hadid. 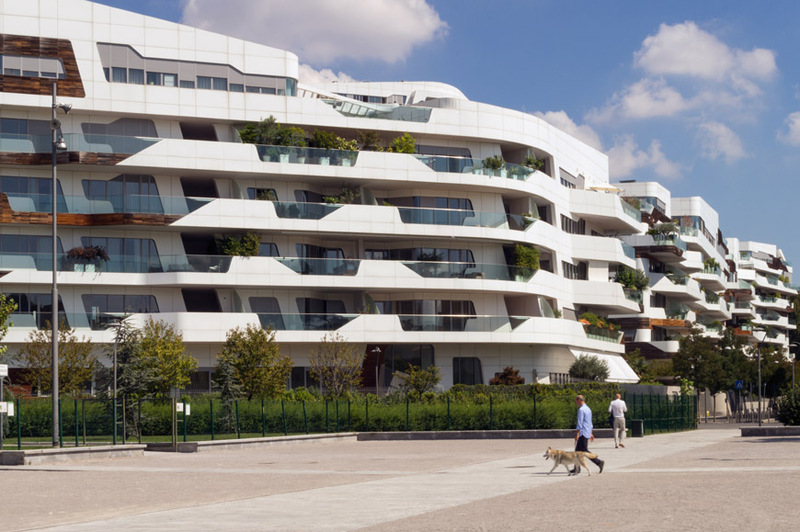 Built two years before the Generali Tower, the CityLife Residential complex designed by Zaha Hadid consists of seven buildings, with a total gross floor area of 38,000 square meters / 409,000 square feet divided into 230 apartments, together with a 50,000-square-meter underground car park. The residences are certainly not aimed at the average Joe, they are quite exclusive and costly apartments for wealthy people, indeed. Something which, generally, makes me a bit biased and unsympathetic, admittedly. 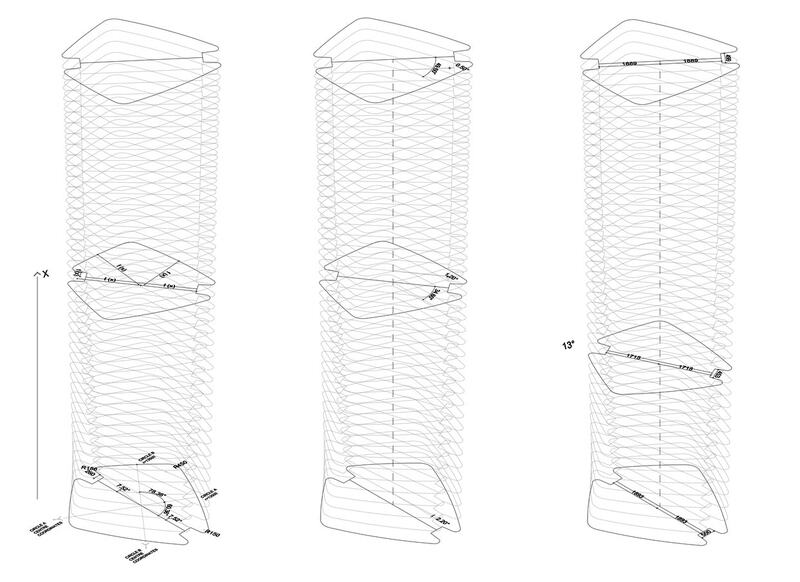 Unlike the Generali Tower, the plastic shapes of the residences emphasize their horizontal lines. 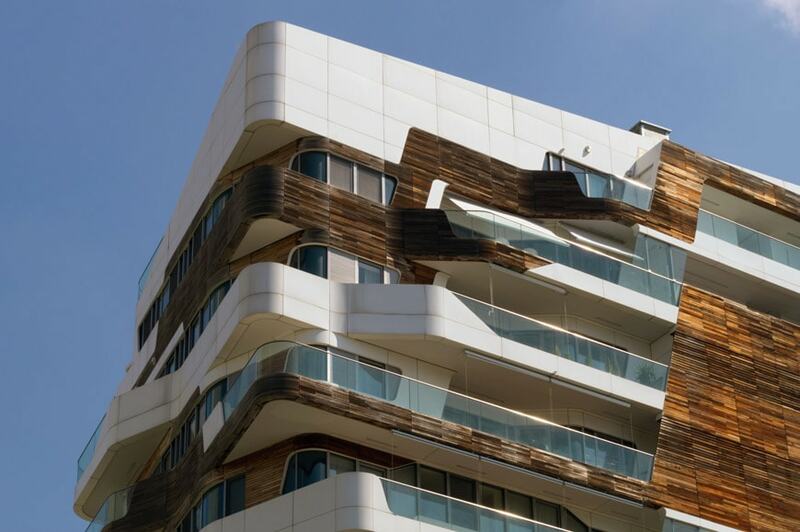 Their distinctive architectural feature is a sequence of curvilinear balconies – clad with aluminum panels, glass, and Canadian red cedar horizontal planks – which gives the buildings a vaguely “geologic” look, as they were sculpted by wind and water. 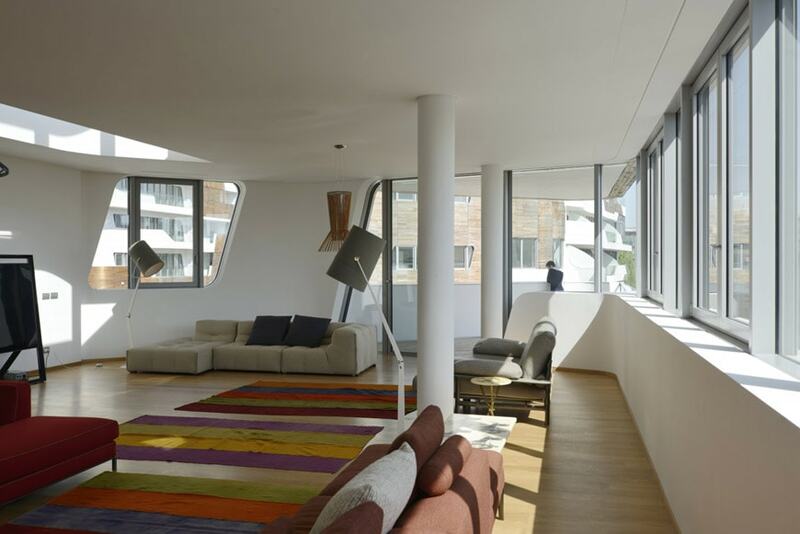 Such a horizontality is also present in the interiors, further accentuated by the use of ribbon windows, and substantially differentiates Hadid’s residential complex from that designed by Daniel Libeskind nearby, which is marked by strong vertical lines instead. 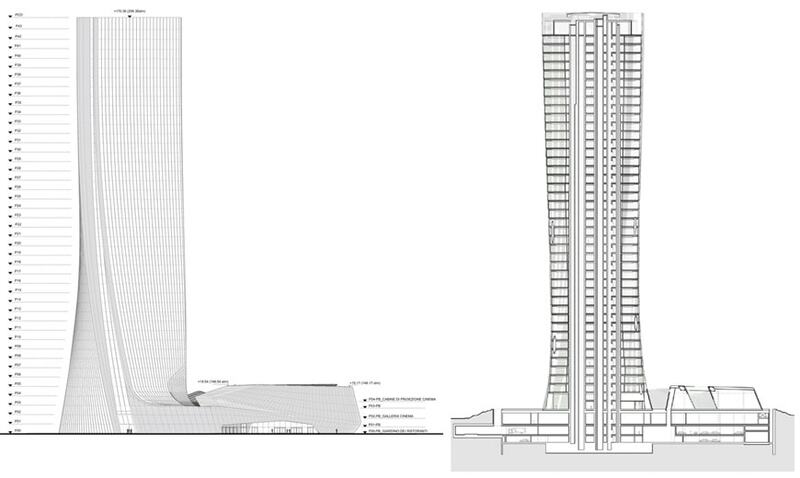 From top to bottom, Generali Tower, north elevation and section, geometric diagram, typical floor plan, and ground floor plan; images courtesy of Zaha Hadid Architects. 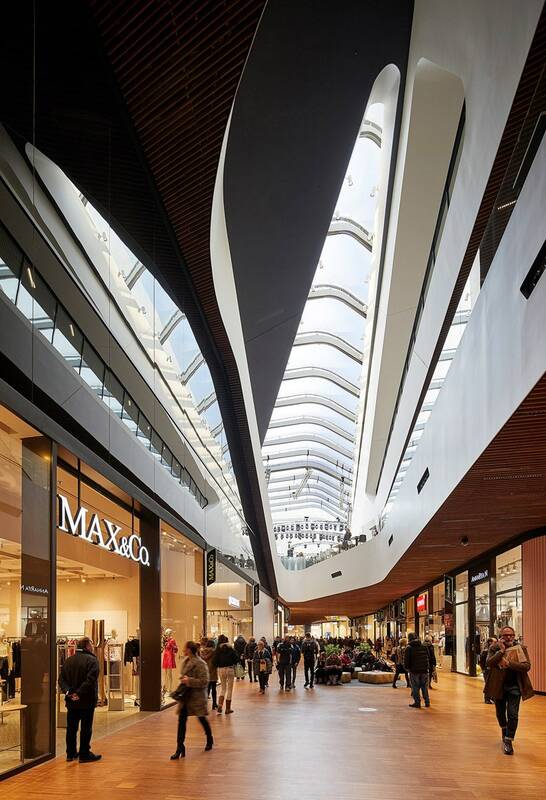 The Podium retail center, interior view; photo Hufton + Crow. Photo © Riccardo Bianchini / Inexhibit. 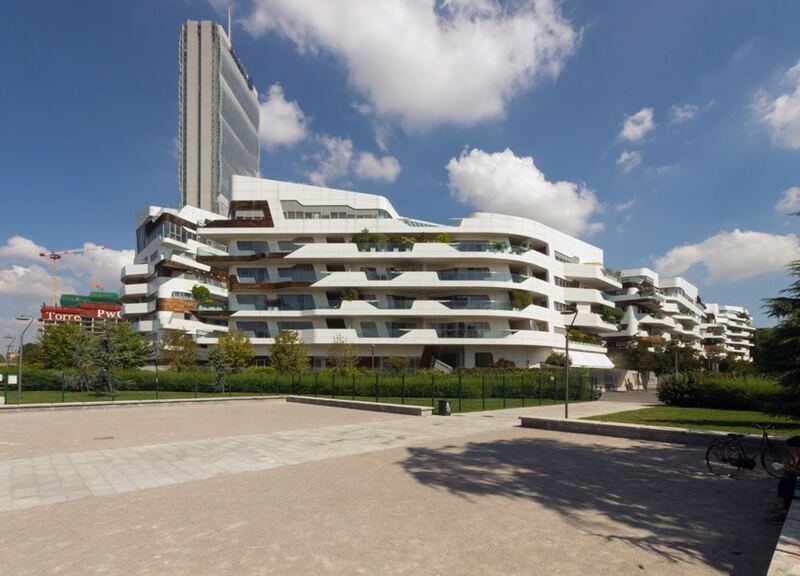 The CityLife residential complex designed by Zaha Hadid with the tower by Arata Isozaki in the background; © Riccardo Bianchini / Inexhibit. 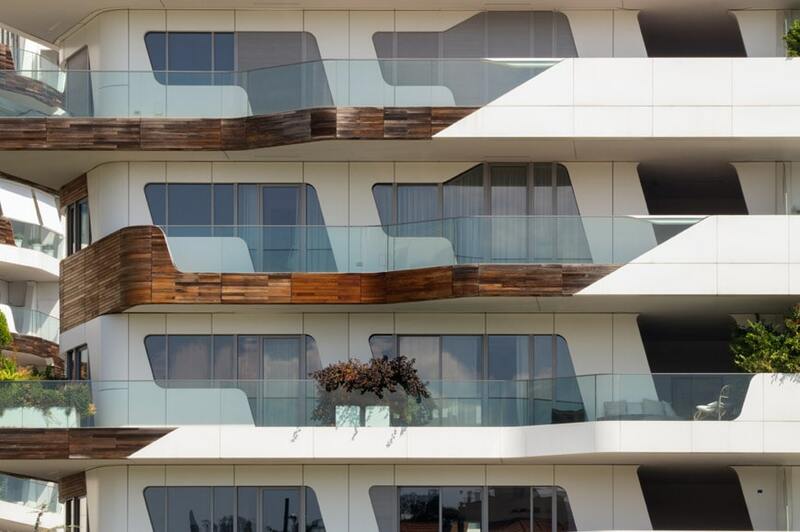 CityLife REsidences by Zaha Hadid, close-up views of teh facades; © Riccardo Bianchini / Inexhibit. 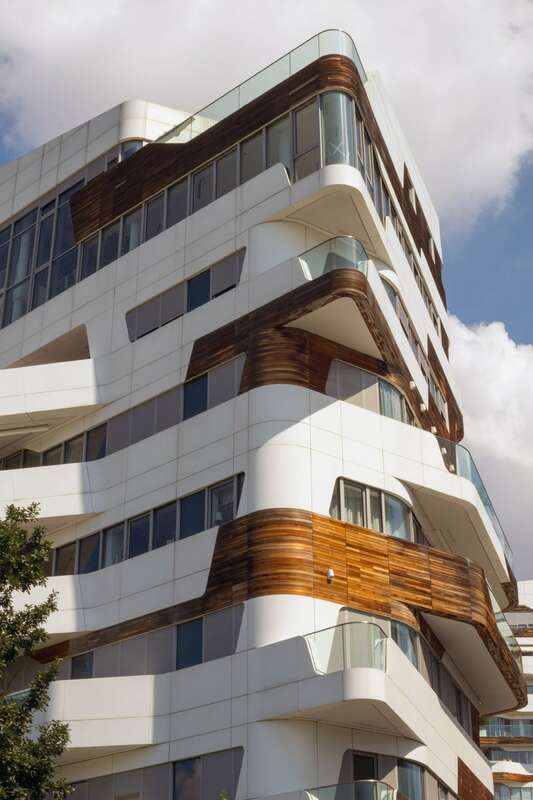 Zaha Hadid Architects, CityLife Residential Complex; photos © Riccardo Bianchini / Inexhibit.